Before I ponder these shoe issues, here are some of the tasselled lovelies that are teasing me, starting with the ones that are in the picture above - from Daniel Footwear. 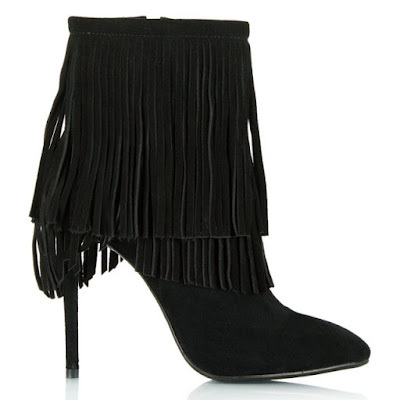 Daniel also have these more sensible ones and the fringe is detachable!! But there's just something about the high ones. And here's the gripe with Daniel - their delivery is £5.50 in Northern Ireland....compared to £3.99 for the rest of the UK (or free for orders over £120 - only on the mainland UK). I'm pretty sure there isn't another retailer of this size that has such a poor grasp of geography and/or a poorly negotiated courier contract. Sort it out guys! 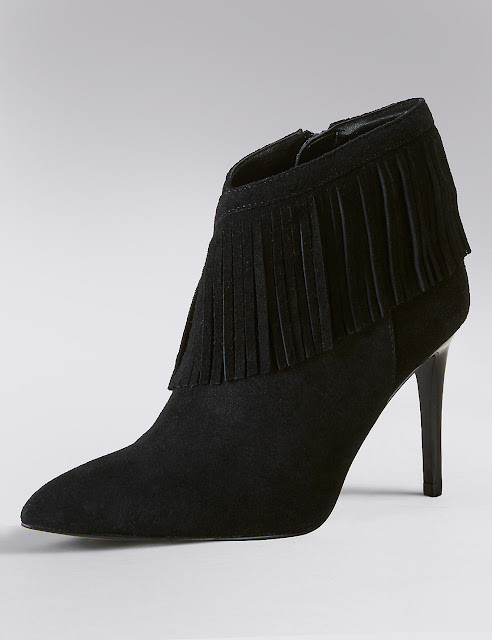 Moving onto Topshop (free delivery in NI over £50) where these beauties have been calling to me since the sale began. Sadly, not in my size but that dipped front is so flattering! 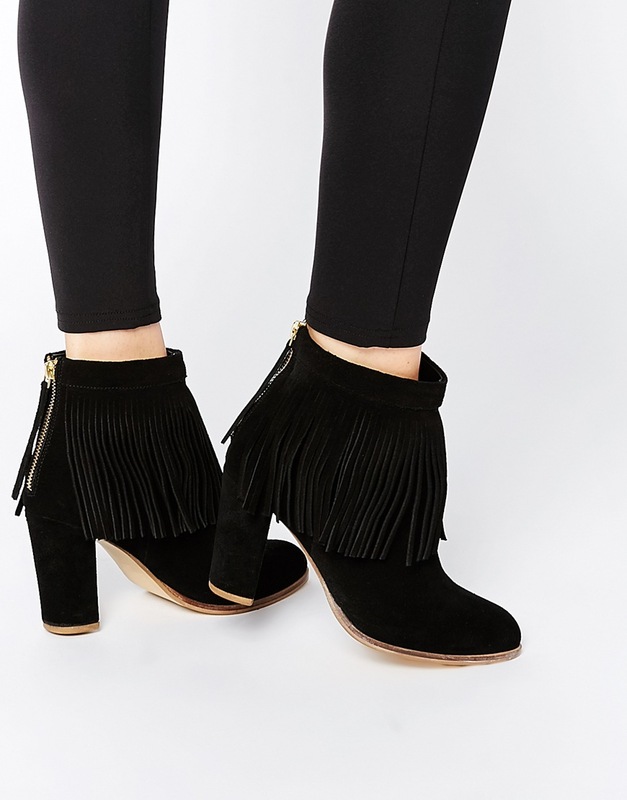 These are also a great option from ASOS as there's not quite as much fringing as the others I've featured so far. Beautiful shape on the foot but they are SO high!! But then right at the end of my search, I find these beauties from M&S (free delivery all over the UK for orders over £50). Perfect height, not too much fringing, nice dip at the front and real leather! 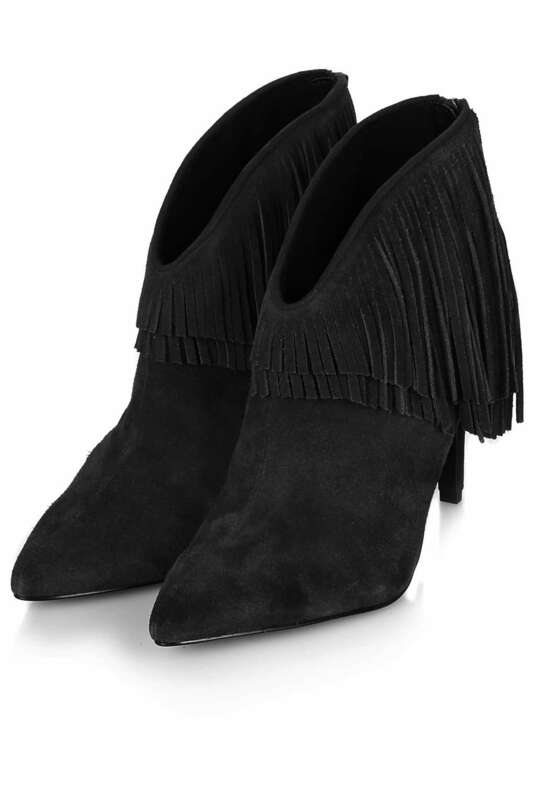 Love them...but the 'I'm not 40 yet' person inside me wants the Topshop ones! I saw how poorly M&S did at Christmas for non-food sales and I thought about why I don't shop there (for non-food) and I confess it's because I associate it with being middle aged. Anyone else feel the same? They're great for all the basics, don't get me wrong but I don't find myself in there as much anymore for fashion as I'm more likely to bump into someone's granny than find something cutting edge. 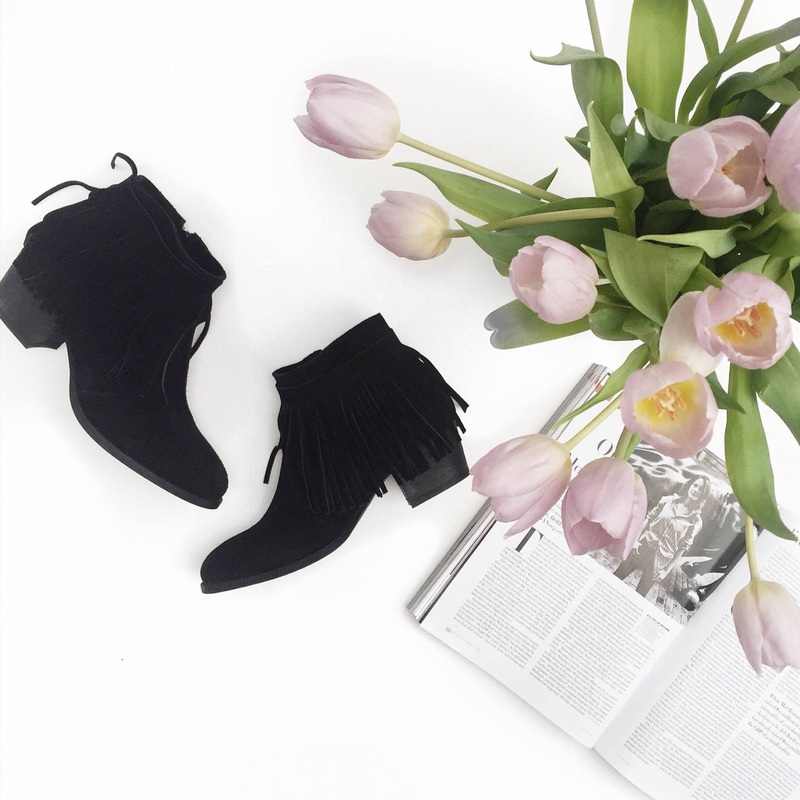 But having said all that those boots are corkers and reading the reviews just convinces me of them even more. Anyone know when there's a 20% off coming up? You're so right ... I never think to look in M&S for clothes. I go to their Beauty Hall, the Food Hall and occasionally the shoe dept, but that's it. Those fringed boots are really gorgeous, but if your heart is set on Topshop (and I can see why - beautiful) then I think you need to make that phone call! They're all lovely but I think it's the m&s ones or the chunky asos ones for me depending on whether you want dressier or day to day. Good luck! I think from memory you're a size 7? If so these might be a cheaper way to try the trend. M@S had some cracking boots in the sale in store today - everything else terrible! Where are they going wrong! careful...bootiful (ha) as they all are, I fear they may be a short term trend...long live the ash jalouse! ps up until recently Lavish Alice were free to UK but £7.99 to N. Ireland...AND it took 3-5 working days. They have amended it in the last few weeks but bloomin' cheek! 20% off online M & S from tomorrow 25th . Maybe its a sign of me being past the 40 milestone but I still have a soft spot for St Michael - under a load of rubbish there are the occasional gems that look amazing and look way more expensive than they are. I too have spotted their tasselled suede boots, although I'd probably go for the tan. M&S 20% discounts are all totally random. They occasionally offer a discount for Sparks card holder so its worth getting one of those. I seriously love those boots! The last sale update...I promise!